In the bad old days when it was a Mitchell's & Butler's chain pub I hated the place, full of "geezer's" larging it at full volume in front of the many TV's installed showing Sky sports plus a pool table that you had to be a "face" there to even get a look in on a game, in short, the railway tavern was a craphole. I was told a few weeks back that the place had been refurbished and under new ownership and apparently does restaurant quality food....yeah right! What I'd been told was correct, you wouldn't know the place these days, smart furnishings, decor art on the walls, superb choices of beer and spirits and yes, the food is restaurant quality, you can tell that by the finicky way the food is presented apparently they have a full time proper chef working there and everything is made fresh on the day. So gone is the pool table, the beaten up furniture that had seen one punch up too many, also gone are the TV's just unobtrusive background music and the punters of old have since pushed off to a spit and sawdust somewhere else. Definitely a place to meet up or spend a quiet evening! 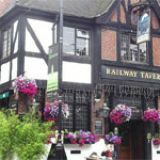 A quirky pub in Crouch End; the Railway Tavern is great for a few drinks, light bites or even a full meal out. Dramatically improved from a run down drinking hole to gastropub with style after a refurbishment and change of ownership in early 2008, this pub is now a good choice for a meal or drinks out in the Crouch End area. Positioned at one end of Crouch End High Street, the pub is in a great location if you live locally or happen to be in the area visiting Alexandra Palace or the local shops. Inside, the pub retains much of the decor from its previous ownership, combined with quirky touches of gilded stands, pretty paintings, painted lights and a large fireplace (not a real fire though), giving the Railway Tavern a quirky and characterful atmosphere. Plenty of tables, chairs and padded benches fill the pub. At the back, the current owner has created a very pleasant beer garden complete with tables and chairs - a great place to sit on a sunny day (apparently this area used to be used as a car park and is a great way of utilising the space for sun worshippers and smokers). The Railway Tavern is an attractive choice for locals looking for a good value night out close to home - the interior decor and menu gives the pub a more interesting atmosphere than your typical boozer. Nice touches like a small games table and indie music playing in the background makes this much more of an adult playground than your usual run of the mill pub. Friendly drinkers propping up the bar and helpful bar staff complete this relaxing, comfortable venue. The Railway Tavern offers an impressively wide range of food, with a separate lunch, evening and weekend menu. Prices are also very reasonable, with dishes ranging from around £5-£10. The weekend menu offers a range of high quality pub food in addition to breakfast and brunch options, including a roast for under a tenner. The lunch menu also offers salads and a mixture of Spanish dishes and more refined options at reasonable prices. The evening menu supplies a range of tapas and more traditional pub grub like burgers (£8.95) or the ubiquitous club sandwich (£5.95). If you’re concerned the quality might match the low prices then you need not worry. The food tastes very fresh and is prepared to a high standard. For example, the fish finger sandwich arrives on delicious granary bread with homemade tartar source, a nice touch for a pub. Tapas (with dishes costing around £3.50 a dish) also offers tasty options, from the delicately spicy chorizo served on a bed of rocket to deliciously piquant artichoke hearts coated in butter with a delightful lemon zing. Overall, the menu offers great value for well presented dished, most of which are prepared on site. A range of drinks are on offer at reasonable prices. Spirits start at about £2.30 plus mixer, so a typical G and T or Bacardi and coke will set you back around £3.50, which is great for the locale. Bottled beers and beer on tap are also available, with a pint of Carling costing £3.20. A nice wine list and, if you want to splash out, some high quality Champagnes are also available. A decent bottle of house wine costs under £15, and can also be bought by the glass. 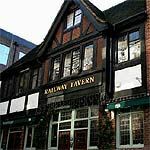 The Railway Tavern is set in a great location in Crouch End and offers excellent value for locals and visitors. It may not be a destination venue in itself, but if you’re in the area it’s definitely worth swinging by.